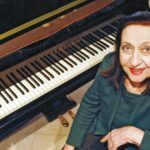 Tel Aviv born Pnina Salzman is the first Israeli pianist to have gained international fame. When she was eight years old, Alfred Cortot heard her play, and at his recommendation, she was admitted into the Ecole Normale de Musique. At fourteen, she entered the Conservatoire of Paris under the tutelage of Magda Tagliaferro. She was very young when she started to play as a soloist around the world. She finished her studies abroad and returned to Israel at the age of sixteen. Bronislaw Huberman, who heard her in Paris, wrote to the Israel Philharmonic Orchestra advising an immediate engagement for the brilliant young artist. She made her debut appearance with the IPO. She was invited to perform in the former Soviet Union in 1963 and is one of the first Israeli artists who has played Israeli music around the world. She has been heard in the world’s most prestigious venues and played with major orchestras under Zubin Mehta, Carlo Maria Giulini, Charles M?nch, Paul Paray, Joseph Krips, Anatol Dorati, Neville Marriner, and others. Authors and critics have written about her and have pointed out her artistic uniqueness. Pnina Salzman chose to live in Israel. She has performed in educational institutions and kibbutzim, for soldiers as well as in hundreds of concerts, contributing to the country’s security and charities. She is a Professor in the Rubin Academy of Music in Tel Aviv University. Many of her students have won international prizes. She is in demand to adjudicate in significant international piano competitions, and has consistently been a jury member at the Arthur Rubinstein International Piano Master Competition.